As part of my #RetreatRepeat New Year’s resolution, I successfully spent 24 hours away from my computer and cell phone this weekend. It doesn’t sound like much, or a great accomplishment, but it was difficult to do nonetheless. 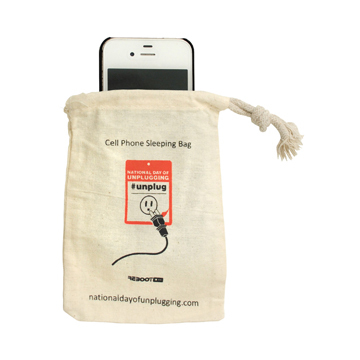 I did this as part of National Day of Unplugging, a U.S. initiative sponsored by Reboot, a group that “affirms the value of Jewish traditions and creates new ways for people to make them their own.” The idea is to create a day of Sabbath for your devices. It was a last-minute decision for me to participate, so I didn’t sign the pledge or get my cell phone sleeping bag. But that made it easier in some ways, because I didn’t have time to talk myself out of it or make any elaborate plans. I just put my phone away when I got home from work and didn’t look at it again until the next evening. So how did it go? The first few hours were the hardest. Only two hours in, I had a terrible urge to sneak a look. But I resisted. After that first night, the next day was easier. And even though it was only 24 hours, I learned a lot about my online triggers and addictions. It’s ok to be alone. My greatest urges came when I found myself in a room alone or sitting at a traffic light. All those times when I would naturally pick up my phone to distract myself, play a quick game or check Facebook, I instead worked on a crossword puzzle, read part of a book, or in the case of driving, found a song to sing along to. Not allowing myself to do any work made me not think about all the work I had to do. It was a busy weekend. I had a presentation to prepare for a conference the next weekend, a grant to apply for, and writing to do. But knowing that I couldn’t do any of that on Saturday—that I ‘wasn’t allowed’—also gave me the freedom to not care about it. Normally I would’ve been stressing out. Instead of enjoying my walk outside with my son or watching a silly show, I would’ve felt guilty that I should be working. But I felt free of that with my pledge, telling myself I would have designated time on Sunday to do the work I needed to do. Nothing was on fire. When I finally broke down and checked my messages, I realized that there were no urgent matters waiting for me. It was a relief, and also a wake-up call: I’m not going to miss any opportunities or be missed at all, really, with a 24-hour break. Check messages when you have the time to do something about them. When I pick up my phone and browse through in at a traffic light or while waiting for my train, I often see messages that I need to reply to but don’t have the time right then. Those messages get marked as “read,” and the next time I log in, my eyes will often skip over them. They get pushed down into the ethers of my un-organized inbox and I forget. So unplugging, especially when I’m busy doing other things, will actually help me be more productive. If I don’t read my email until I’m actually in a place where I can respond to the messages, I’ll be able to take care of things more efficiently and with less stress. I can’t promise I’m going to disappear from the Internet for 24 hours very often, but I will definitely try to be more conscious of my decisions to stare at my devices. Sorry, Angry Birds. But I’ll miss you.